The directors are responsible for the preparation, integrity and fair presentation of the Summarised Group Annual Financial Statements for the year ended 30 June 2018 ("Summarised Group Annual Financial Statements") of Aspen Pharmacare Holdings Limited and its subsidiaries. The directors consider that in preparing the Summarised Group Annual Financial Statements they have used the most appropriate accounting policies, consistently applied and supported by reasonable and prudent judgements and estimates, and that all International Financial Reporting Standards ("IFRS") that they consider to be applicable have been followed. The directors are satisfied that the information contained in the Summarised Group Annual Financial Statements fairly presents the results of operations for the year and the financial position of the Group at year-end. The directors further acknowledge that they are responsible for the content of the Integrated Report and its supplementary documents, as well as its consistency with the Summarised Group Annual Financial Statements. The directors have responsibility for ensuring that accounting records are kept. The accounting records should disclose with reasonable accuracy the financial position of the Group to enable the directors to ensure that the Summarised Group Annual Financial Statements comply with the relevant legislation. The preparation of the Summarised Group Annual Financial Statements in conformity with IFRS requires management to make estimates and assumptions that affect the reported amounts of assets and liabilities at the date of the Summarised Group Annual Financial Statements and the reported expenses during the reporting period. Actual results could differ from those estimates. 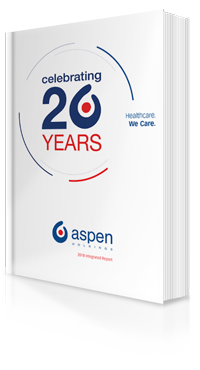 Aspen Pharmacare Holdings Limited and its subsidiaries operate in a well-established control environment, which is well documented and regularly reviewed. This incorporates risk management and internal control procedures, which are designed to provide reasonable, but not absolute, assurance that assets are safeguarded and the risks facing the business are being controlled. The going concern basis has been adopted in preparing the Summarised Group Annual Financial Statements. The directors have no reason to believe that the Group or any company within the Group will not be going concerns in the foreseeable future, based on forecasts, available cash resources and facilities. These Summarised Group Annual Financial Statements support the viability of the Company and the Group. The Code of Conduct has been adhered to in all material respects. The Group's external auditors, PricewaterhouseCoopers Incorporated, audited the Summarised Group Annual Financial Statements, and their report is presented here. The Summarised Group Annual Financial Statements were prepared under the supervision of Deputy Group Chief Executive, Gus Attridge CA(SA) and approved by the Board of Directors on 26 October 2018 and are signed on its behalf.